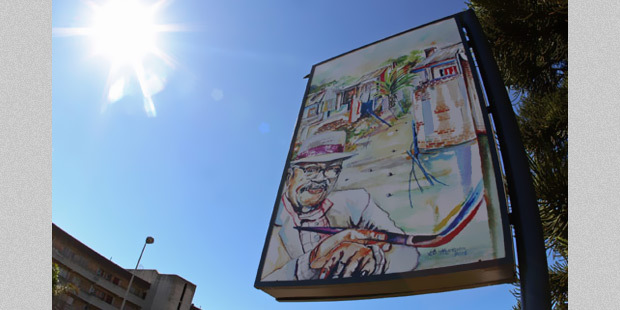 Port Elizabeth artist Andrew Nhlangwini used celebrated painter George Pemba’s favoured medium, watercolours, to create the portrait on the memorial outside the Pemba family home in Port Elizabeth. In 1952, George Pemba resigned from his hated job as a rent collector to become a full-time artist. Though encouraged to do so by fellow pioneer artist Gerard Sekoto and by his own successful exhibitions, Pemba did not believe he would be able to "live by art". Working in the garage of his house, where he lived for more than 40 years, he felt himself to be in what he called "the wilderness", although his talent was obvious to those exposed to it: In 1931, one of Pemba's portrait subjects, a man named Ncgobo, told him, "But I never thought you could draw souls!" Even nine years before his "grand tour" of South Africa, Pemba was chomping at the bit to flee the confines of the city. George Pemba struggled to find the funds for formal art training, and to establish his name in the art world. Take a quick glimpse at how the lives of George Pemba and Gerard Sekoto mingled early in their careers in a remarkably unexpected way. Read extracts from the diaries of George Pemba. Here, he describes how he raised the money to go on a painting tour of South Africa, and his odyssey’s inspiring effects on his work. See the work of Port Elizabeth’s precursor to Zapiro, George Pemba. 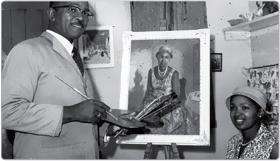 In 1952, George Pemba resigned from his hated job as a rent collector to become a full-time artist. Family, friends and art lovers gathered in the New Brighton home of the late pioneer artist George Pemba last Thursday for the unveiling of a portrait of Pemba. Port Elizabeth artist Andrew Nhlangwini is behind the painterly memorial recognising the life and work of George Pemba. Dandheni Andrew Nhlangwini is best known for his interpretative works that reflect traditional African narratives and oral histories. Nhlangwini says George Pemba's memorial artwork is both a tribute and a means of bringing the memory of the artist into the public domain.